After completing our first trip, we set to work on organizing the receipts so we can report how your donations are being used. This was our founding trip for Guatemala, and all donations received for this trip went straight to the field. The pie chart below shows how the funds were divided and used. In fact we had to use $588 from our general donation account to cover some of the expenses. As we received $11,160 in donations for this mission, we recorded a net loss of $588 for this trip. 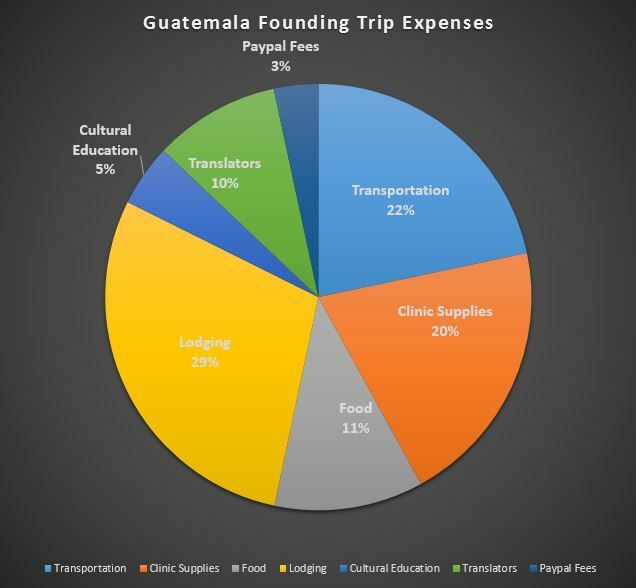 Now that we have gathered even more information from our time in Guatemala, we will be able to find some alternative lodging that will be able to reduce some of the expenditures without sacrificing safety. By staying closer to the villages, we will also be able to reduce some of our transportation cost. We now have the data we need to develop the budget and expenses for follow up trips. Future trips will also include a line for capital expenses (equipment to be used on multiple trips, scrubs, and other items that are reused) and overhead (funds to cover administration costs, website, etc.). We will always strive to keep these low so that the majority of the funds (and impact) go directly to the people we are serving in the field. The more volunteers that go on the trips also reduces the amount of overhead and capital expenditures. Our budgeting models are based on teams of 15-20, and our hope is to keep overhead to less than 5%.